Life of a BZscrapper: Happy 2nd Birthday to Little Acres Creations! Happy Birthday Wishes to the crew at Little Acres Creations! It's their 2nd birthday and we're celebrating from today through the 20th of April with a couple hops, a challenge, and a shipping discount.. not to mention lots of prizes! You can check out all of the details for the celebration on the Little Acres Blog here and get started today, because today is a YouTube Hop along with your first chances to win some awesome prizes! You should definitely check it out! So apparently I was not done with the whole Distress Oxide Lift technique that I learned over on the Simon Says Stamp blog in a video by Gina K! I decided I'd try one with the sunflowers from the Little Acres Summer Blessings set. My favorite sunflowers that I've ever grown were some beautiful ones in burgundy colors... not your traditional, but when am I ever traditional. I mean.. I love those too! But I also loved making these ones with a little of that burgundy color in them. 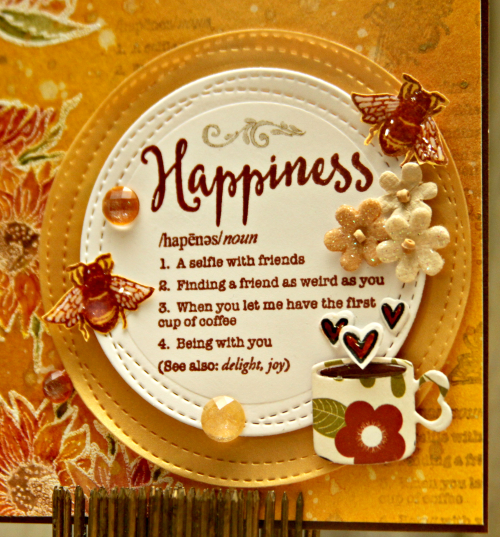 I loved having the chance to use this awesome Friendship Defined stamp set! And when I got this one, I didn't even realize there was a coffee reference in one of the sentiments and a little coffee cup on the set..lol! I guess it was meant to be! 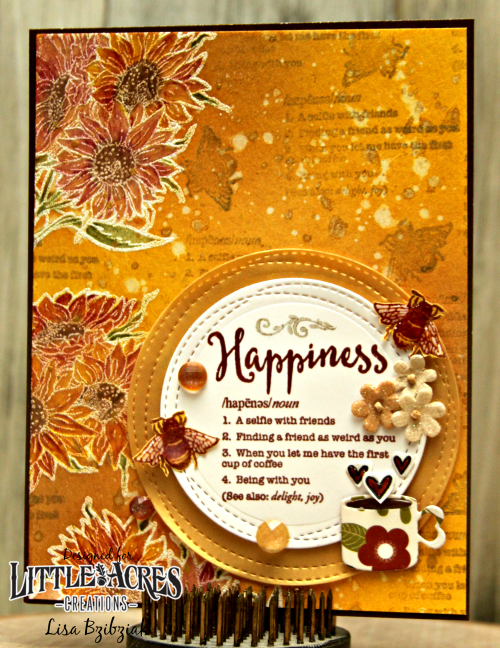 I didn't use the coffee cup stamp in the set because I needed something just a little bit bigger so I used the die from Cas-ual Fridays to cut that cute little cup in printed papers that didn't fight too much with my very full background. And those bees are from the Summer Blessings set also. I stamped them on yellow cardstock and cut them out. I added some white gel pen to the wings and then covered the whole thing in liquid glass to give them some dimension. So, I did the Distress Oxide Lift here, colored in the flowers with some Prisma pencils and Gamsol, and then splattered some water... sopped that up with a paper towel... and then used a brush to splatter some Heidi Swap Color Shine in gold and sopped that up with a paper towel. Then I took some Docrafts metallic gold ink and stamped the Happiness Definition and some of the bees so they'd be barely visible. So that's it for me today! Head on over to the LAC blog to see what's going on now through the 20th and the ways you'll have chances to win prizes.. trust me.. you want to check this out! See you again later this week! This is GORGEOUS! LOVING the colors and those flowers!!!!!!!!! 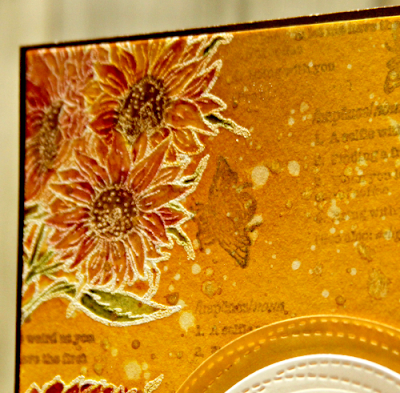 Absolutely stunning design and I love sunflowers too! The ones you did with those colors are perfect. I have often admired the burgundy colored sunflowers as well when the seed catalog arrived. Beautiful work using the Distressed Oxides too! I LOVE, LOVE, LOOOOVE that background Lisa!!! Such a Stunning card!!! !